This is more than a simple saddle bag retaining clip that takes less than 10 minutes to replace. Harley-Davidson is facing steep competition. Not only from less expensive motorcycles imported from Asia, but electric motorcycles from Zero, Brammo (now owned by Polaris) and also from core customers who look for a mainstream gasoline cruiser from Indian and Victory. Polaris will undoubtedly be first to market with a chrome-plated electric cruiser given the previous discussion by CEO Matt Levatich. In addition, it’s not clear that Harley-Davidson is getting much of a sales bump from the decision to double-down on support of outlaw biker gangs as part of their marketing pitch. The hard-edge reference is NOT about the one-percent patches, rather licensing support of TV shows like Sons of Anarchy (SOA) and other Hollywood fluff. Trying to appeal to people who don’t have much adventure in their lives with a TV show prescribing on the road escapism… well it escapes me! Meanwhile they try so hard to alienate and re-write the Baby Boomer chapter! 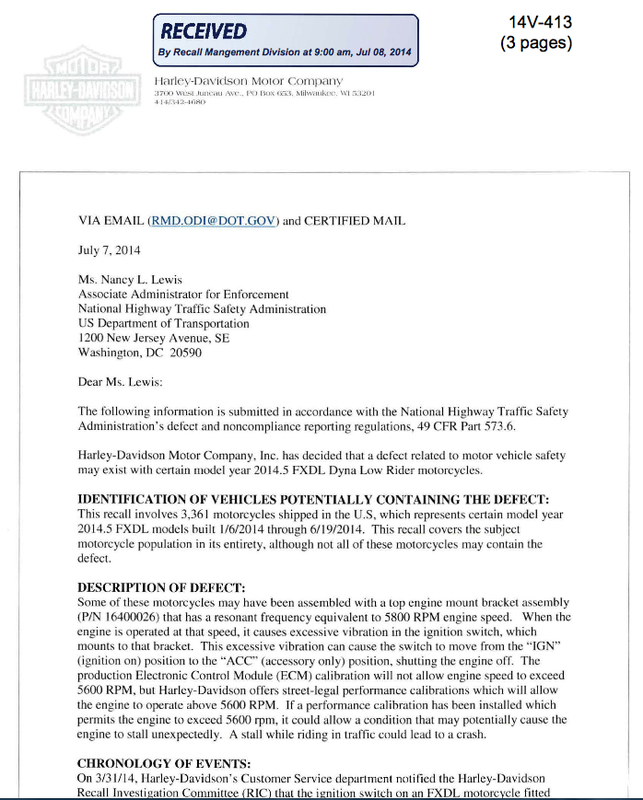 And on that quality topic, Harley recently issued a saddlebag recall – campaign number 15V-427. The motor company is the poster child for the “land of recalls” sans Chevy. So many, that owners find it difficult to recall when their bikes didn’t! Snarky comments aside, all manufactures have issues, but Harley-Davidson is unique in acknowledging and using quality as a key differentiator and strategy for increasing sales. I’m not sure how well that will work for them. Meanwhile the Dealers are replacing the 4 (2 on each side) saddle bag pin retaining clips free of charge. 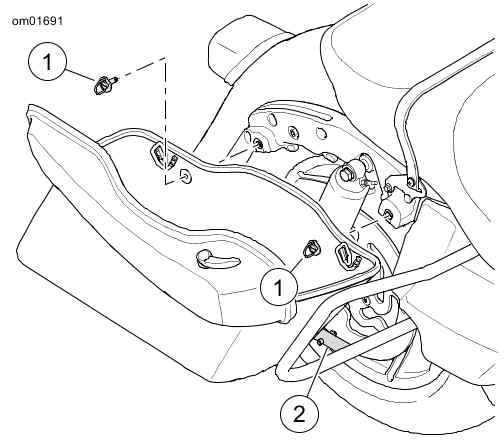 The motor company issued a recall stating that the saddlebag mounting receptacle, P/N 10900009 on some model year 2014 and 2015 Touring family vehicles (see drawing #1 above) may not adequately secure the saddlebag to the motorcycle during use. If this condition remains undetected, the saddlebag may become separated from the motorcycle while it is in motion, possibly creating a hazard for other motorists including your riding buddy’s in formation behind that “separated” bag. If this happens there is a good chance you’ll be picking up a new “road rash” painted saddlebag and dirty laundry strewn across the roadway! UPDATED: July 23, 2015 (1:40pm PDT) — the recall effects 185,000 motorcycles which covers certain 2014 and 2015 Road King, Street Glide, Electra Glide Ultra Classic, Ultra Limited, Police Road King, Police Electra Glide and CVO Ultra Limited bikes. Also affected are 2014 CVO Road King and the 2015 Electra Glide Ultra Classic Low, Ultra Limited Low, Road Glide, CVO Street Glide and CVO Road Glide Ultra motorcycles. No injuries or crashes have been reported due to the saddlebag issues and no information has been provided on the number of “separated” bags. UPDATED: July 29, 2015 — Polaris introduces its 2016 line up which includes the Victory Empulse TT ($19,999), an electric model which rolls out way ahead of H-D’s LiveWire. It’s based on the Brammo Empulse R motorcycle produced by the electric motorcycle division of Brammo Inc., which was acquired by Polaris earlier this year. 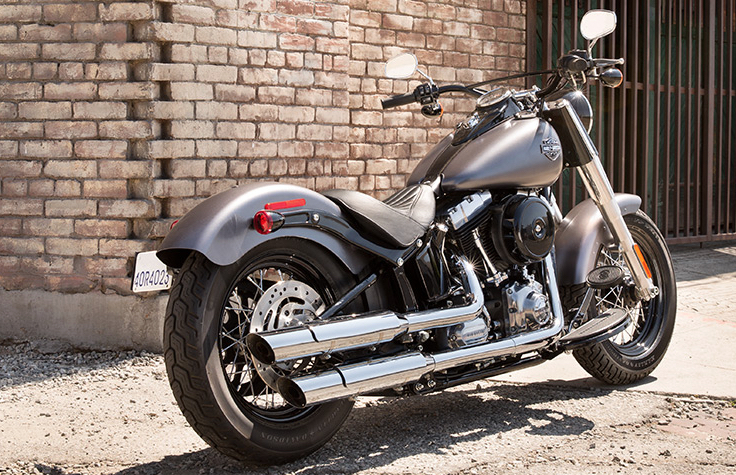 Harley-Davidson (NYSE: HOG) released its Q4’14 financial report along with full-year results. The motor company reported a drop in net income for the final quarter, but overall profits were up for the year. Celebrating its 112th year, Harley-Davidson shipped 270,726 motorcycles around the world in 2014. The Road Glide had a big comeback and sales have been robust and represented about 14% of total U.S. retail sales in the fourth quarter. For the full year 2014, the Company shipped 270,726 motorcycles to dealers and distributors, a 3.9 percent increase compared to 2013 and in line with guidance. Full-year revenue from motorcycles was $4.39 billion compared to $4.07 billion in the year-ago period. Revenue from parts and accessories was $875.0 million compared to $873.1 million in 2013. Consolidated revenue topped the $6 billion mark for the first time since 2006. In 2014, international sales of new Harley-Davidson’s grew at more than 5% and accounted for more than 36% of total retail Harley-Davidson motorcycle sales which is up from 30% in 2008. You can read the full financial press release HERE. Quality control issues in 2014 seem to bedevil Harley-Davidson. 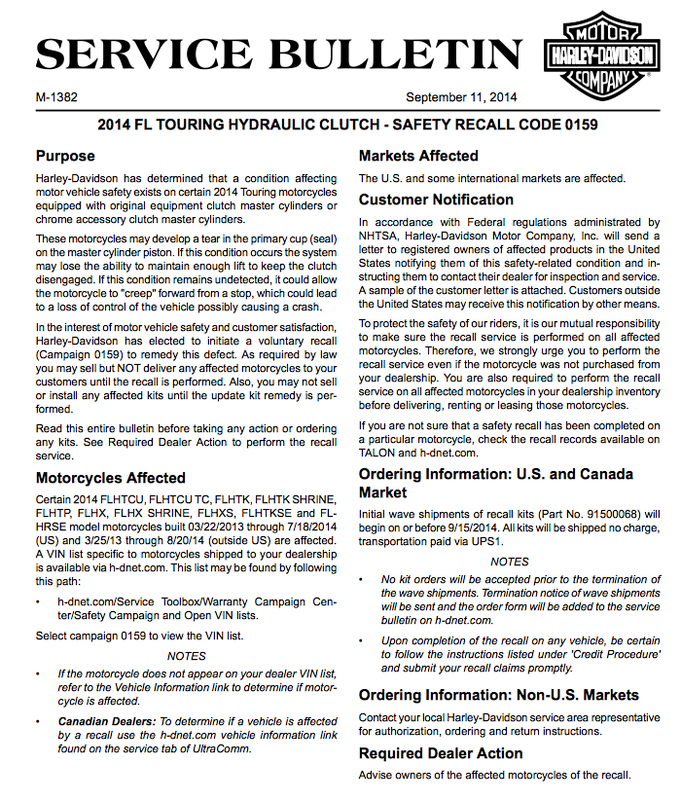 The latest examples are the recalls of 4,688 model year 2014-2015 FLS Softail motorcycles manufactured March 25, 2013, to October 2, 2014 for a lamp-outage detection issues and 1,560 of its 2015 Tri-Glide Ultra Classic FLHTCUTG motorcycles due to rear-brake master cylinder issues. The Softail motorcycles may have been manufactured without lamp-outage detection for the front turn signals and a rider may not be aware that a front turn signal is not working. And without working front turn signals, there is an increased risk of a crash. Harley-Davidson is notifying owners, and dealers will correct the body control module software, free of charge. The recall began in December 2014. The Harley-Davidson’s number for this recall is 0618 or NHTSA campaign number: 14V725000. On the 3-wheel, certain Tri-Glide Ultra Classic motorcycles manufactured from July 14, 2014, through Oct. 15, 2015, could have rear master cylinder assembled with an incorrect piston. Harley says this piston may not provide the proper support and may allow a tear in the primary cup. If the primary cup develops a tear it will decrease the brake performance and might increase the risk of a vehicle crash. Harley-Davidson will notify owners, and dealers will replace the rear master cylinder, free of charge. The recall began December 16, 2014. The Harley-Davidson’s number for this recall is 0162. Owners may contact Harley-Davidson customer service at 1-800-258-2464 or National Highway Traffic Safety Administration Vehicle Safety Hotline at 1-888-327-4236, or go to www.safercar.gov. While Harley-Davidsons recalls this year pale in comparison to the massive 300,000 bike recall issued back in 2011, but that was simply a rear brake light problem. Most of the 2014 Harley-Davidson recalls seem to be centered around rushed product development and/or shoddy workmanship. That same workmanship issue which has dogged the automakers. And speaking of, these are the same automakers which just 4-years ago Mr. Keith E. Wandell (Harley-Davidson CEO and President) stated; “Look in a mirror – Harley was already so far down that same (GM) path it wasn’t even funny.” Basically warning Harley-Davidson employees that it was turning into a GM… and the credibility issue that becomes being associated! Prior to the above recalls we’ve seen the motor company recall more than 105,000 model 2014 Touring and CVO Touring motorcycles because of a problem with the anti-lock braking system that caused the front wheels to lock up without warning. In August, it recalled over 4,500 bikes for a faulty ignition switch. It’s also recalling about 1,400 of its 500 and 750 Street bikes from the 2015 model year for a possible fuel tank leak. I’ve captured the 2014 recalls HERE. Is Harley-Davidson re-testing the customers reputation of shoddy workmanship (and raising the ghost of Harley’s past)? It would do well to get a tighter grip on these issues and instill the pride of craftsmanship that should be the motorcycle maker’s hallmark. Harley-Davidson is recalling more than 105,000 motorcycles from the 2014 model year because their clutches may fail, causing stopped bikes to creep forward and potentially crash. The motor company said it will rebuild clutch master cylinders for motorcycles impacted by the recall. The company knows of 19 low-speed tip-over crashes tied to the problem, with three minor injuries reported. 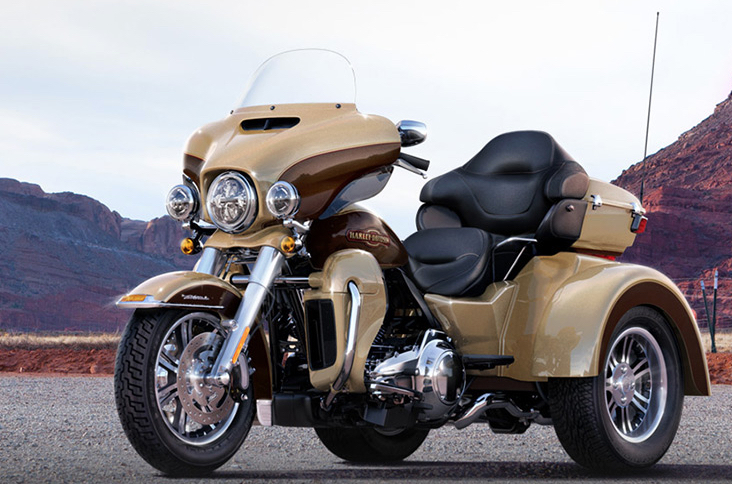 Bikes named in that recall include the Electra Glide Ultra Classic and the CVO Road King. Harley-Davidson Motor Company (Harley-Davidson) is recalling certain model year 2014 Electra Glide Ultra Classic (FLHTCU), Ultra Limited (FLHTK), Police Electra Glide (FLHTP), Street Glide Special (FLHXS), Street Glide (FLHX), Tri Glide Ultra (FLHTCUTG), CVO Limited (FLHTKSE), CVO Road King (FLHRSE), CVO Breakout (FXSBSE), Electra Glide Ultra Classic Twin Cooled (FLHTCUTC), Ultra Limited Shrine (FLHTK SHRINE), Street Glide Shrine (FLHX SHRINE), and CVO Softail Deluxe (FLSTNSE). In the affected motorcycles, a component in the clutch master cylinder may fail, reducing the pressure available to keep the clutch disengaged. If the clutch does not remain disengaged, the motorcycle may creep forward while the rider intends to be stopped, increasing the risk of a crash. Harley-Davidson will notify owners, and dealers will rebuild the affected clutch master cylinders, free of charge. The recall is expected to begin in September 2014. Owners may contact Harley-Davidson customer service at 1-800-258-2464. Harley-Davidson’s number for this recall is 0159 and 0160. In addition the motor company is also recalling 1,384 motorcycles made earlier this year to test for possible fuel tank leaks. The recall is on model year 2015 XG500 and XG750 motorcycles manufactured June 11, 2014, to August 14, 2014. Dealers will test fuel tanks subject to that recall and replace them for free if any leak from under their caps. No injuries, accidents or fires have been tied to that problem. The event has come a long way since it was known as the Black Hills Classic when Clarence “Pappy” Hoel, and some friends from the Jackpine Gypsies motorcycle club, decided to hold a racing event. It’s now known as the Sturgis Motorcycle Rally and the 74th Sturgis Motorcycle Rally is in the books. The Sturgis Motorcycle Rally is the worlds largest and next year is the 75th Anniversary. This will undoubtably ensure that attendance will break previous records. There is even a special 75th logo being rolled out for such a legendary event and will be emblazoned on every imaginable piece of merchandise for you to spend some cash. You can thank Paul Resnick of Hot Leathers who designed the logo for the 75th Anniversary. Hot Leathers is the primary licensee for the Sturgis Motorcycle Rally. Previous Sturgis statistics are HERE. The European Parliament mandated that all new motorcycles and trikes sold in Europe with engines larger than 125cc are required to have ABS by 2016, and because of “global harmonization” – a term to describe manufacturing vehicles to uniform standards – suggests that the requirement will make ABS much more common in the U.S. I would have anticipated a bigger push for ABS because the rate of fatal crashes is 31 percent lower on a motorcycle with antilock brakes than in the same models without ABS, according to research by the Insurance Institute for Highway Safety. Thirty-one percent is a big number. Or about one in three motorcycle crashes that could possibly be avoided. With ABS, riders stop more quickly and stopping distances improve on wet and dry surfaces. ABS reduces concern that the wheels will lock up, which might result in a skid. Locking up the brakes in a panic stop robs the rider of any steering control which can easily lead to a skid and crash. In the often wet northwest riding environment, maintaining control of steering during an emergency stop is most valuable. ABS is becoming increasingly common on larger motorcycles. In fact, BMW Motorrad USA started making ABS standard equipment on all its motorcycles beginning with the 2012 model year. 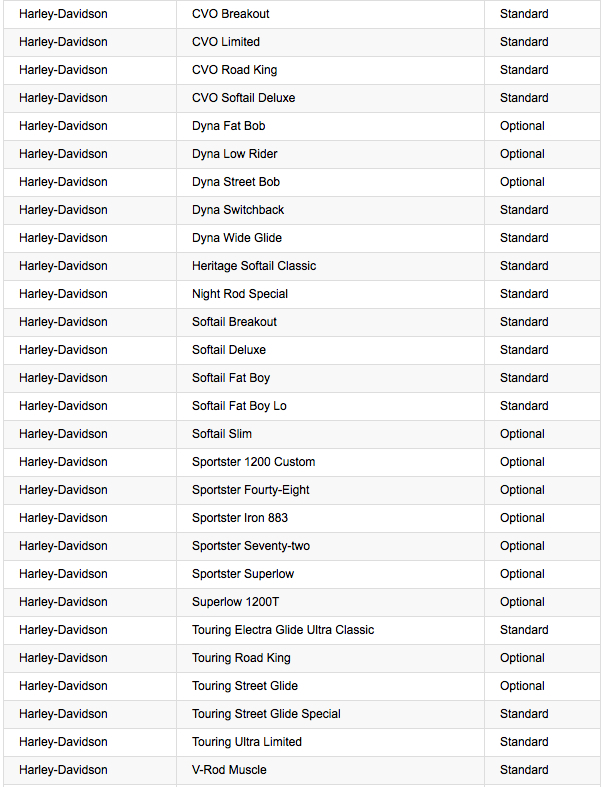 In the above photo is a list of 2014 Harley-Davidson models that include ABS. One concern is that it’s been difficult to find ABS on smaller motorcycles. Those smaller motorcycles are often purchased by less experienced riders, who are likely to benefit most from ABS. From my vantage, if you don’t have ABS brakes it’s one of the best incentives to consider trading/buying a new motorcycle that does. Chart photo courtesy of Consumer Reports. 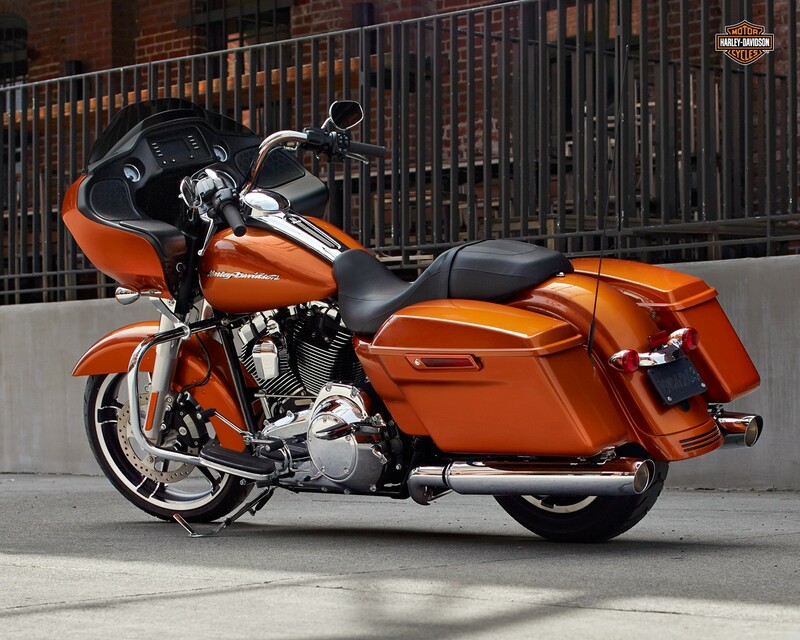 It’s surely just a coincident that two months ago GM icon Jim Federico was hired on as the Harley-Davidson VP of Engineering and now the motor company has issued an ignition switch recall on more than 3,300 FXDL Dyna Low Rider bikes. You might recall that ignition switch problems have plagued General Motors and have now turned up in the motorcycle business. It turns out that engine vibration can turn the switches from ‘on’ to the ‘accessory’ position. If the switch goes to “accessory,” the engine can shut off while being driven and potentially cause a crash, however, there have been no crashes or injuries reported from this problem. This recall involves 3,361 motorcycles shipped in the U.S, which represents certain model year 2014.5 FXDL models built 1/6/2014 through 6/9/2014. Some of these motorcycles may have been assembled with a top engine mount bracket assembly (P/N 16400026) that has a resonant frequency equivalent to 5800 RPM engine speed. When the engine is operated at that speed, it causes excessive vibration in the ignition switch, which mount to that bracket. The excessive vibration can cause the switch to move from the “IGN” (ignition on) position to the “ACC”(accessory only) position, shutting the engine off. The production Electronic Control Module (ECM) calibration will not allow engine speed to exceed 5600 RPM, but Harley-Davidson offers street-legal performance calibrations which will allow the engine to operate above 5600 RPM. If a performance calibration has been installed which permits the engine to exceed 5600 rpm, it could allow a condition that may potentially cause the engine to stall unexpectedly. A stall while riding in traffic could lead to a crash. The chronology of recall events are: On 3/31/14, Harley-Davidson’s Customer Service department notified the Harley-Davidson Recall Investigation Committee (RIC) that the ignition switch on an FXDL motorcycle fitted with a non-Harley-Davidson exhaust system moved on its own from the “IGN” (ignition on) position to the “ACC” (accessory only) position during operation on a chassis dynamometer for tuning purposes. The RIC initiated an investigation and analysis of this issue. A search of existing warranty data in April, 2014 disclosed no warranty events, but a search of customer complaints disclosed one complaint, which referenced an event similar to the initial report, i.e., an FXDL model motorcycle fitted with a non-Harley-Davidson exhaust system, operated on a chassis dynamometer. During May, testing was initiated to attempt to re-create this condition. During May and June, the RIC met to review test and field data information. The testing indicated that this condition could potentially occur both on the road as well as on the dynamometer, that a non-Harley-Davidson exhaust system was not necessary to create the condition, but could enhance it, and that the production Electronic Control Module calibration was not able to create the condition, as an engine speed of 5800 rpm or greater (production calibration includes a 5600 rpm rev limiter), was required to create the condition. Another review of the warranty and complaint databases in June revealed a total of four events, all of which occurred on motorcycles believed to be fitted with non-Harley-Davidson exhaust systems and ECMs with higher than production engine speed rev limit calibrations. There were no reported crashes or injuries. On 6/19/14, the RIC completed its review and analysis, and referred the issue to executive management. On 6/27/14, upon review of the results of the RIC’s investigation and analysis, Harley-Davidson’s executive management made its determination that a safety related defect existed in the subject population and declared a recall to remedy the issue. Authorized Harley-Davidson dealers will replace the engine mount bracket assembly and ignition switch knob on the affected motorcycles with the components provided in the recall kit which is covered by the warranty.